Most of you who submitted stories to MOD2 should have by now received an email from us. There are still a handful that have yet to go out, as we correct typos in email addresses and so on, but they should all be sent soon. If you have not heard from us by Tuesday November 8, please contact us with the title of your story and the email address you used to submit. With 2,000 emails to send, it’s possible a few got missed, for which we apologize. Thanks for your patience! Matt will be at the Minneapolis Indie Expo this weekend along with MOD1 artist Katie Sekelsky and (on Saturday morning only) MOD1 author John Chernega! Stop by, say hello, pick up a book or bring yours to get signed, and grab one of our free MOD2 sampler booklets! Some folks have been posting their stories online. 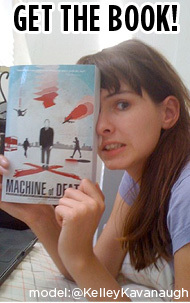 If you’d like to read some of the stories we couldn’t fit in the book, you can search the #MachineofDeath hashtag on Twitter, or one enterprising reader has also set up rejectedmod2.tumblr.com. There’s also a list growing here at Tree Lobsters. The official title and full table of contents will be announced at our Super-Stupendous Magic & Variety Show in Los Angeles on November 17. It’s a free evening of entertainment we’re putting on as a special “thank you” to celebrate a year of MOD — and you’re invited! But even if you can’t make it to L.A., you’ll be able to watch a live stream right here on the site. And what’s next? We’ve made no secret of the fact that we want to publish more of your stories. We’re going to focus hard on MOD2 for now, but then what? More books? Ebooks? A podcast magazine? There are lots of directions we could go, and we have lots of crazy ideas, but we’d like to hear yours too. What would you like to see? (Remember that we have to, and want to, buy the stories that we publish — so “put ’em all on a blog!” is not necessarily the most viable option.) But leave a comment with your thoughts! That’s it for now. Thanks, everyone. What a crazy year this has been. Come on, let’s do it all again.